Ghugni Chaat is one of the most loved street foods from the lanes of Kolkata. And contrary to the popular belief about street foods, it is quite a healthy protein packed dish to indulge in. Try any area in Kolkata that is famous for its street food, you are bound to find a conspicuous vendor selling Ghugni. 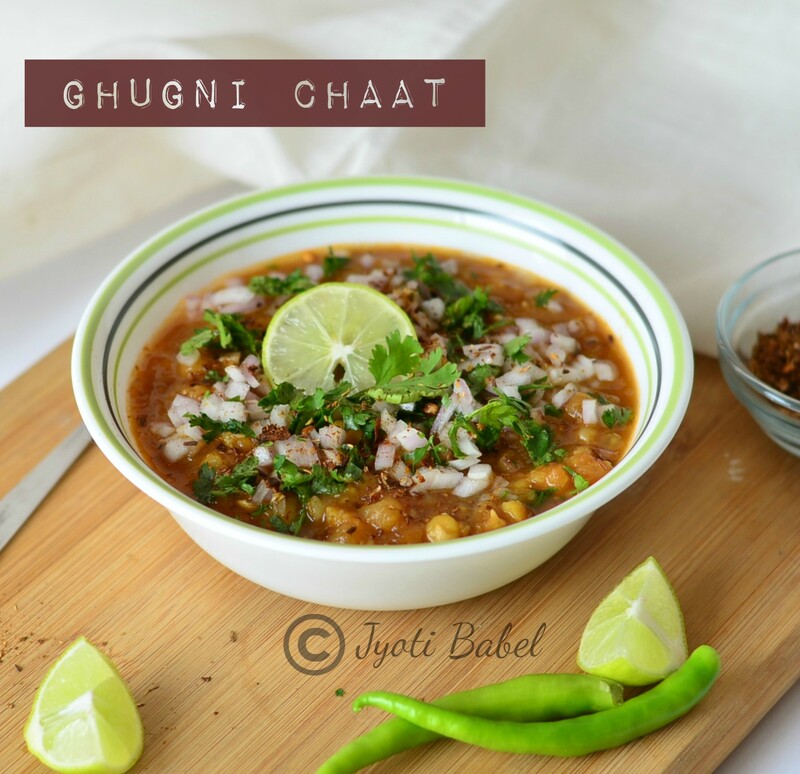 In simple words, ghugni is a spicy curry made from dried white peas (that has been soaked for at least 6 hours or overnight) topped with chopped onions, tamarind chutney, a handful of coriander leaves and a specially roasted masala. Ghugni is to Kolkata what chole chaat is to Delhi. It is one of those dishes I make when I am running out of veggies in my pantry. With just a few ingredients, you can have a hearty and tummy satisfying meal. When I was in school, there was a vendor who could come to our school park to sell ghugni during lunch breaks. From what I remember, there used to be a huge crowd surrounding his cart – all enjoying a plate of hot ghugni chaat. Back then I was quite averse to street foods since I was not sure what kind of hygiene standards they maintained. So, I never bought a plate of ghugni from him. Although today I enjoy having street food from street vendors, I am still very choosy. Well, that’s just me. These days whenever I crave street food, I end up making it at home. 2 medium tomatoes blanched and pureed. 1 large boiled potato, boiled, peeled, and mashed roughly. In order to prepare the roasted masala, take 2 tbsp cumin, 1 tbsp coriander seeds and 2 whole red chillies. Dry roast it in a pan over medium heat till they change colour. Grind it into a coarse powder in a pestle and mortar. Add 1 tsp of black salt and mix. Store it in an airtight container and use as needed. 1. Wash the dried yellow peas and soak them in fresh water for 6 hours or overnight. 2. In order to cook the peas, add the drained yellow peas to a pressure cooker and water such that the peas are covered in water. Add ½ tsp salt and cook it on high until one whistle. Wait till the pressure is released and open the cooker. 3. Heat a Kadhai, add oil and when it is heated add hing and cumin seeds. Will the cumin seeds splutter, add ginger-chilli paste, garlic paste and stir. After a few seconds add the chopped onions and a pinch of salt. Cook till the onions are translucent. It will take about 3-4 minutes. 4. Now add the tomato puree and stir. Add the turmeric powder, chilli powder, cumin powder and stir again. Cook till the tomato puree leaves oil in the sides. 5. Now add the cooked peas and mashed potato. Give it a good stir. Check the spices. Add more if necessary. Bring it to a boil and then cover and lower the heat. Cook for about 5 minutes. When done turn off the heat. 6. To serve, add the ghugni to a deep plate. Top it with a dash of lemon juice, tamarind chutney, chopped onion, chopped coriander, and the specially prepared roasted spice mix. Serve it hot. This is my favourite chaat. I love yellow peas in a gravy. You are absolutely true it is a goodness packed dish in whole! Nice. Oh this is fantastic..I was little averse to the yellow peas until I found this way of making a chaat..very nice! Ghughni is a delicious chaat , I have never had it outside but have made it at home quite a few times . That bowl of Ghughni is calling out on me . That is one protein rich and delicious chaat. Looks soo inviting. This is similar to ragda, isn't it? Absolutely love this chaat. 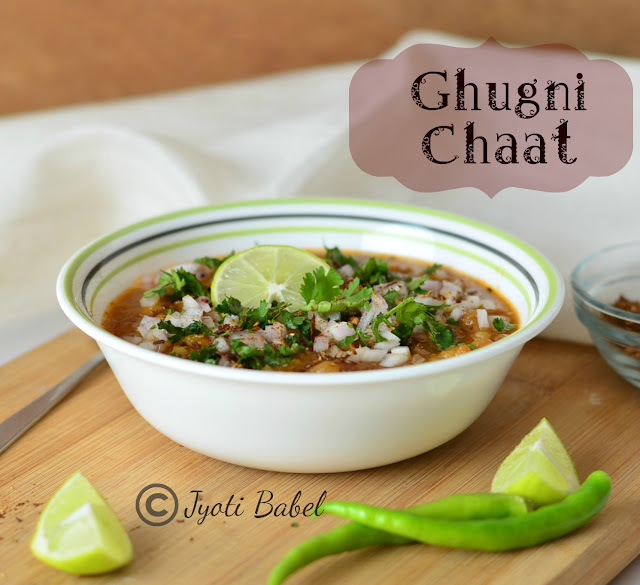 Ghugni chaat is my weakness, such a delicious dish, definitely worth to make often at home. I love ghugni chat but have never tasted it outside. I make it every now and then and we all love it. Looks fantastic! Ghugni chaat looks super delicious. I wish to grab that bowl from screen. This place is stunning. The architecture is beautiful and the decoration is spectacular. Environment was transparent and resonant and warm and immediate. I loved this event venue Atlanta and my experience here was very exciting.